Drywall Experts - Nail Pop, poorly finished drywall joints, loose cracking metal corner bead or joint tape, holes, cracks, water damage walls and ceilings can look like new again! Your home will look great when friends, relatives and neighbors visit. 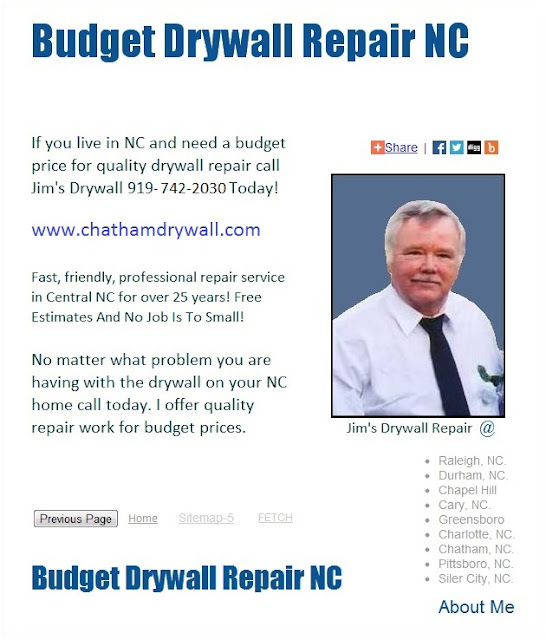 A Local Chapel Hill drywall contractor that has provided wall, ceiling and texture repair service, free estimates and price quotes for over 27 years! Drywall Experts 919-742-2030 Expert Repair Finishing Texture Work - If you live in Raleigh, Durham, Chapel Hill, Cary, Pittsboro or anywhere in Chatham County NC and need a drywall expert for repair service call a professional contractor that has provided local service for over 27 years. Estimates are always free and no job is to small. Drywall Experts 919-742-2030 Expert Repair Finishing Texture Work - If you live in Raleigh, Durham, Chapel Hill, Cary, Pittsboro or anywhere in Chatham County NC.